Radishes are usually thought of as one of the first crops to produce in the spring, but have you ever considered growing radishes in winter? If you own a Solar Gem Greenhouse, you can be growing radishes throughout the winter months without much effort. The key is making sure they get enough sunlight and maintaining a growing temperature of 50 degrees F for most of the day. So, as long as your Solar Gem is in a fairly sunny spot and you keep it in that temperature range during the day, we can get started. We’ve found that a good way to grow radishes is by using plastic plug trays, growing 1 radish per cell. For radishes, we like the cells to be about 2″ across and 3″ deep, but you can go a bit smaller if you like smaller radishes. Make sure they have a drainage hole in the bottom – most do. You can get radish seeds from mail order companies. Some of them have seeds on sale this time of year, just because they are trying to clear out their stock before the spring. We like medium-sized, round varieties – Cherry Belle, Red Head, Early Scarlett, etc… You can also try the larger round varieties – German Giant, Crimson Giant, etc…, but be ready to pick them before they get too big for the cell they are growing in. We’d probably stay away from the long, cylindrical varieties – the cells usually just aren’t deep enough. But no matter which variety you prefer, growing radishes in winter is something everyone with a greenhouse should try at least once. Fill the trays with a decent soil mixture. Radishes aren’t fussy at all and will grow in most soil conditions. We usually use a 50/50 mix of top soil and composted manure – the inexpensive stuff from our local big box store. Fill the cells up most of the way with soil, leaving about 1/4″ of space at the top for watering. Plant 1 seed per cell – poke your index finger into the soil, a little deeper than your fingernail, drop in a seed and cover it with loose soil. Water it in and let nature work her magic. Keep the tray in a warm, sunny spot. The seeds will germinate in temps as low as 45 degrees F, but they’ll do better at 50-60 degrees F. Once established, the plants can handle near freezing nighttime temps, and the cooler weather makes for a milder radish with more complex flavors. In addition, the plants will do best with at least 6 hours of sunlight per day. Keep the soil in the trays moist – usually a squirt of water every 2-3 days will be enough. Most varieties are ready for harvest in about a month. If you end up with a lot of radishes and you get sick of eating them raw, you might try cooking them. 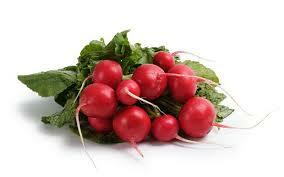 Surprisingly, most radishes taste a little bit like brussel sprouts or cabbage when you cook them. We like to halve them and put them in a foil packet with a pat of butter and some salt and pepper to taste. Seal the packet by folding the edges, place it on a baking tray and cook in the oven at 350-375 degrees F for 30 minutes or until tender. Give it a try and you’ll find that growing radishes in winter can be fun, rewarding, and delicious. Got a vegetable gardening question? Post it on the Solar Gem Greenhouses Facebook page and I’ll be happy to answer it!